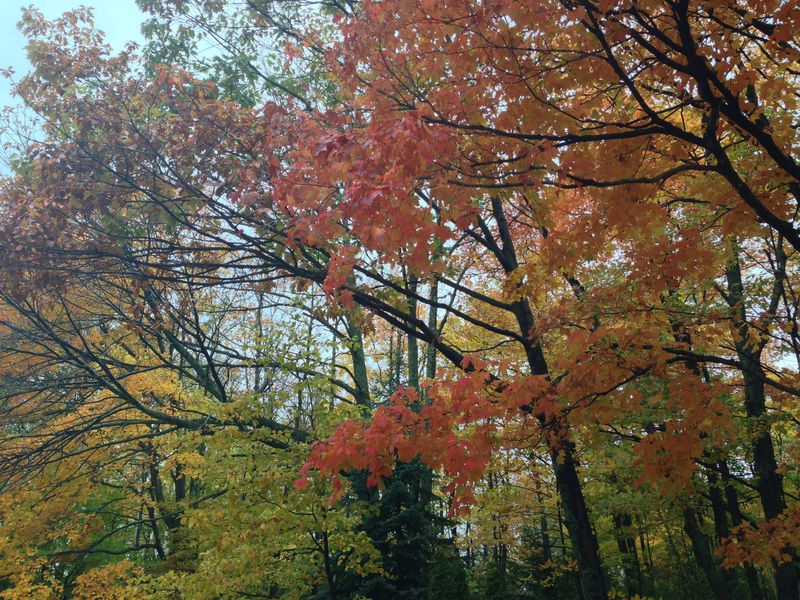 Speaking of fish boils – Baileys Harbor will welcome the new season with their annual Autumnfest & Classic Auto Show, this year featuring a Fish Boil at Kendall Park to help wrap up the event! 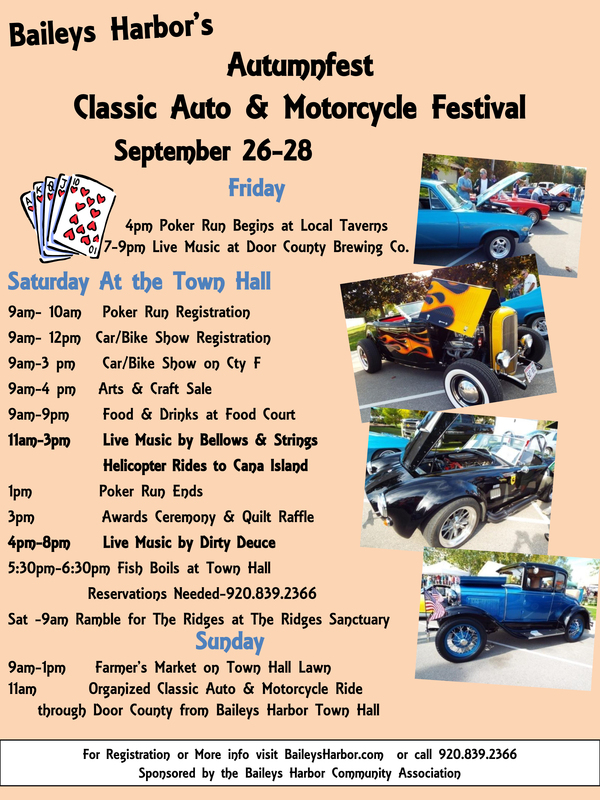 Start the weekend out right by getting started on the Poker Run. Register and get your card at any of the participating pubs including PC Junction (which is an experience – visit the Pizza Czar too!) on the corner of County Roads E and A, and locations in town like the DC Deli – where you’ll find the tastiest Pulled Pork and Beef Brisket sandwiches ever, and Door County Brewing Company – where you’ll also find live music with local group, Deathfolk, Friday night from 7-9pm. 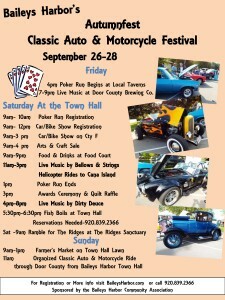 On Saturday the Poker Run continues from 9am-1pm, and the festival gets going outside the Town Hall. 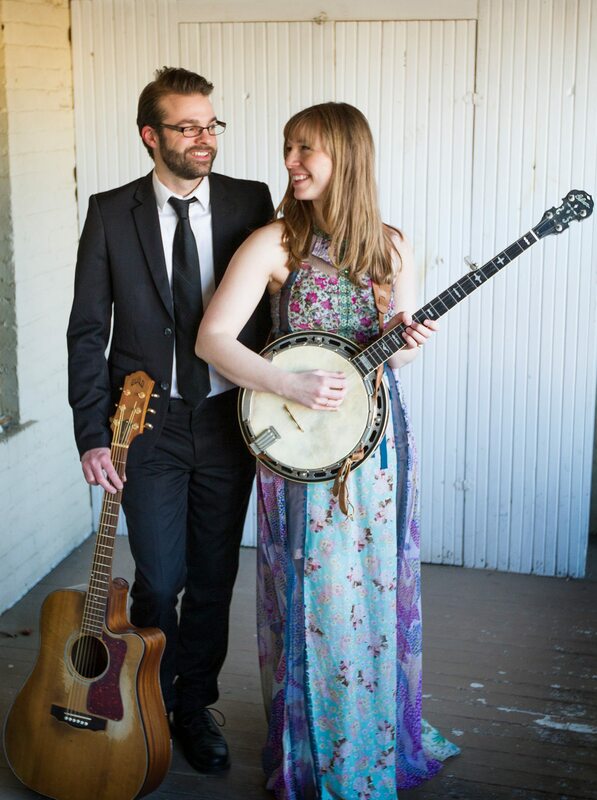 From 9am-9pm there will be food and beverages for sale at Kendall Park where you’ll also get to check out the Classic Auto & Motorcycle Show from 9-3, Arts & Crafts from 9-4, and live music with Bellows & Strings from 11-3. Hop a Helicopter Ride to Cana Island Lighthouse for $50 or take the Harbor Tour for $40 with UP North Helicopters. At 3pm on Saturday the Awards Ceremony takes place, then from 4-8 enjoy more live music with Dirty Deuce while filling up at the Block Party style Fish Boil at Kendall Park (5:30-6:30pm boil over every 30 minutes). Call for Fish Boil reservations 920.839.2366. 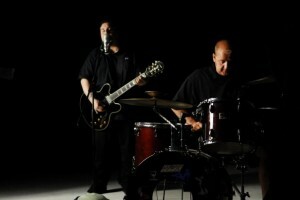 From 7-9pm you can also enjoy Live Music with Beach Patrol at the Door County Brewing Co. then head over to Peninsula Pub at 9pm for Shower’oke! Sunday brings the Farmer’s Market outside of the Town Hall from 9am-1pm where can shop for local produce, flowers, handmade arts and crafts, and more, and at 11am there will be an Organized Motorcycle & Classic Auto Ride through Door County starting from the Baileys Harbor Town Hall. Fish Creek is a favorite shopping destination for Door County visitors, and this weekend, September 26-28, 2014, is a bargain hunter’s dream! The Annual Inside Outside Sale invites you to stroll the sidewalks of Fish Creek and checkout special sales inside and outside of tons of unique shops, boutiques, and galleries! Breathe in the crisp autumn air as you meander outside from Founders Square through downtown Fish Creek, all the way up to the Top of the Hill Shops where you’ll experience a “Taste of the Top” – with food, music and more outside vendors and sales! Free trolley rides will also be available to hop aboard at marked spots in case your legs start to wear out. 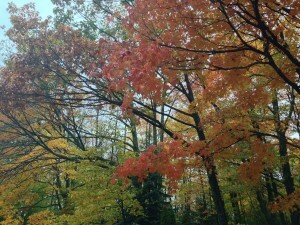 On your way in to Fish Creek, swing by the Settlement Shops for their Fall Art Fair, and stop at Orchard Country Winery & Market for their Annual Fall Harvest Festival! All that shopping can work up an appetite, so stop and warm up at one of Fish Creek’s fabulous restaurants: Bayside Tavern makes a killer Bloody Mary and a Bayside Coffee that is literally on fire! Cooper’s Corner offers a variety of innovative lunch and dinner options, but this season, you’ll definitely want to try their Roadhouse Burger piled high with onion strings, jalapeno habanero cheese, cider slaw, and Door County Cherry BBQ sauce! 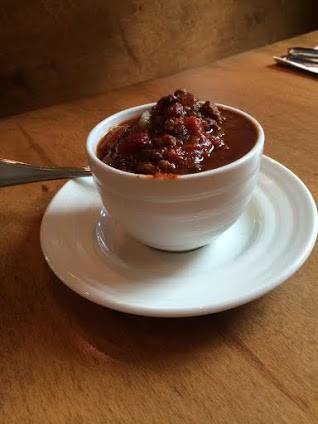 Check out live music at The Cookery Restaurant & Wine Bar on Saturday night, Sept. 27, at 7pm with Craig Konowalski, and don’t pass up a hot bowl of their delicious Chili. Go visit the Gnomes at Not Licked Yet, open this fal and serving special flavors of the day in addition to lip-smacking hot and cold sandwiches. Gibraltar Grill is a favorite place for a great steak – and when you order their Featured Steak (grilled to your liking and served with potatoes and vegetables) a donation is made to a local nonprofit in Door County! For authentic south of the boarder flavors and great pizza, visit Arroyo Bay Grill (just up by the Top of the Hill Shops), or make a date to experience the Friday Night Fish Fry and classic cuisine options at The English Inn. 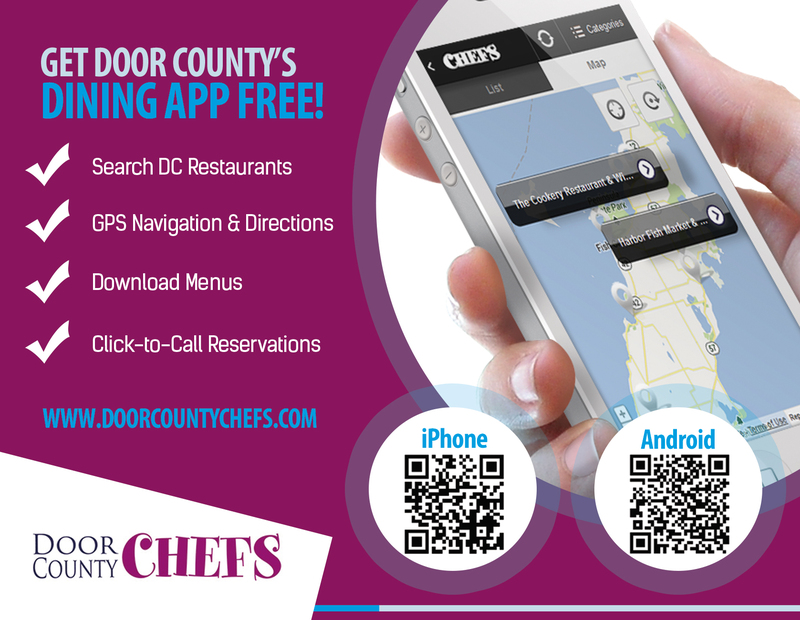 Want to find even more delightful dining in Door County? 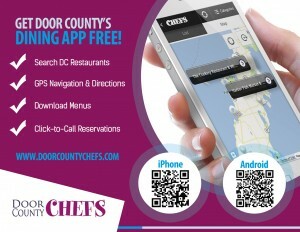 Find what you’re hungry for with the Door County Chefs FREE Mobile Dining App!